This is to let you know that Tucker, who was known as Wiley while he was with BREW, passed away this morning. He had contracted an unusually aggressive form of mast cell cancer. He had several surgeries to treat the condition, and was undergoing chemotherapy treatment, which slowed, but could not stop the progress of his disease. Yesterday morning he began limping and tripod walking on his left rear leg. The vet diagnosed a partial tear of the cruciate ligament. Since he was already experiencing mobility problems related to his cancer, this injury made it almost impossible for Tucker to get around. Rather than let him linger on in pain until the cancer took him, we made the decision to have him euthanized. Tucker has been an unending source of joy for us, and a good companion for our other beagle, Molly. Until his illness, he was enjoying life with us in our home in Florida. We are forever grateful to BREW Midwest for saving his life from the shelter in Indiana, to Toscha for fostering him, and for letting him become a part of our family. 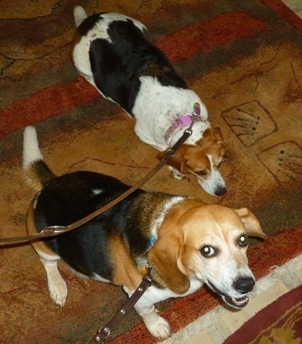 I am attaching a copy of a photo we took a few days ago, of Tucker and Molly getting ready to go for a walk.